Everyone loves lasanga! Depending on how its prepared, it can be loaded with calories, carbs and fat. Now Im not a big fan of pasta when on a weight loss eating program, but if eaten in moderation and especially after a very active workout, or used as a cheat meal, this recipe shouldnt hurt your progress one bit. Just make sure you eat a “normal” portion! For the sauce: I like to make my own sauce because I can control the amout of salt and flavor, I love using fresh tomatoes and there is NO SUGAR added. Most commercial pasta sauces are loaded with sodium and sugar and other additives. In a medium saucepan, sautee the chopped garlic and onions. Wash the tomatoes. You can run the tomatoes, with skin, in a blender for a second to crush it a bit more. Add the crushed tomatoes and let it fry for about 5 minutes. Add the entire can of tomato paste. Sometimes I will add more tomato paste to make it richer in flavor. Add the dry spices, 1.5 to 2 cups of water (depends on how thick you like the sauce) and bring it to a boil before letting it simmer. While its simmering, prepare the meat mixture. Brown the meat in 1 tbsp olive oil and a clove of garlic. Once its brown and cooked, add the meat in your sauce and bring it back to a boil. Then return to simmer for about 15 minutes. In large pot, prepare pasta noodles according to directions on the box. While you are bringing the water to a boil, prepare the filling. Filling: Combine the cottage cheese and ricotta cheese, parmesan cheese and egg in a bowl. Be careful with this. The cottage cheese can make this dish a bit watery. If you do not like it like that, I would omit the cottage cheese and just do the ricotta, but it will make it more fattening. However, if you dont mind, mixing it half and half will cut the fat and calories a bit. Once the noodles are prepared, drain them. In a casserole dish, spoon a layer of the sauce first. Then add a layer of the noodles, overlapping so there is no gap. 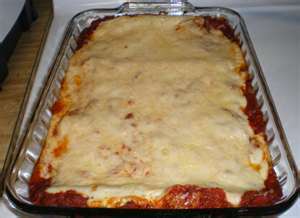 Then spoon a layer of half of the filling, sprinkle with half of the shredded cheese. Repeat layers. Top with remaining mozzerella cheese and a little parmesean. Bake in a preheated oven at 375 degrees for 30 minutes. Serves about 8 to 10.